One of the new craftable mounts by jewelcrafters, the other ones being Sunstone Panther, Sapphire Panther and Jade Panther. Mix them all together and you'll get Jeweled Onyx Panther. If you would like to see the model/video of the mount, here is the link. There are 3 other colors of this mount, pretty sick looking. At the moment these neither show as Soulbound nor "Requires Jewelcrafting: 600" (or whatever) which means that hopefully everyone will have access to them. the cost of each Something Expensive is 100k. How do i know? cause the selling price is 25k, and we know the selling price is 25% of the buying price. This is one of the new Mists of Pandaria BoE mounts crafted by Jewelcrafters. It will likely require the Jewelcrafter to reach level 600 in the profession. and will cost Orb of Mystery x5 (which cost 100,000g each if only sold by vendors). Since Mists of Pandaria is still in Beta, these materials and their quantities/pricing are subject to change. I will try to keep this post up-to-date as the beta progresses. jewel-crafting is a big and costly profession which is also very profitable as well, so everyone will want to make money of this mount or want to get it cheep without all the Fees of crafting or buy value! This one deserves it's own special achievement. After all, it's the red one. "Ready To Form Voltron! Activate Interlock! Dynatherms Connected! Infracells Up! Megathrusters Are Go! Let's Go Voltron Force! Form feet and legs. Form arms and torso. And, I'll form the head!" It can be noted that while flying on this mount you'll hear a distinct sound that resembles traveling in high-wind speeds with the air blowing in your ear. This sound will cease as soon as you stop forward momentum and just float. I'm not sure if all the mounts do this, but anytime you start to fly or hit "Q" or "E" while flying your lion will roar, making him a heck of a talkative mount. im guessing, since it doesn't say anywhere "requires X jewelcrafting to mount" that it can be mounted on any character regardless of whether they have the jewelcrafting profession or not? The skin of this mount looks like a car paint for a sports car. JC's will need to grind Cloud Serpent rep in order to obtain the patterns for this mount. This recipe can be bought for 200g from San Redscale, once you are Honored with The Order of the Cloud Serpent. This is just one of the new amazing Jewelcrafting mounts. However the item does not currently require any Jewelcrafting to actually 'mount' this mount. Don't forget to Tip your friendly Jewelcrafter's! 20 Primordial Ruby which you can find in numerous containers and get from Mining, Prospecting and transmuting. 4 Living Steel which are made by using Alchemy. There are two spells that can make Living Steel. One requires 6 Trillium Bar and has a 1 day cooldown (Transmute: Living Steel) while the other requires 3 Trillium Bar and 3 Spirit of Harmony and has no cooldown (Riddle of Steel). 2 Serpent's Eye which are sold by Danky in the Shrine of Seven Stars and by Krystel in the Shrine of Two Moons . They each sell them for 1 Spirit of Harmony. They can also be created using 10 Sparkling Shard which are found while Prospecting. This panther mount combined withSunstone Panther, Sapphire Panther, and Jade Panther creates the slightly larger Jeweled Onyx Panther. Note that to create the Jeweled Onyx Panther all 4 panthers (Sunstone Panther, Sapphire Panther, Jade Panther and Ruby Panther) must be in your bags UNUSED. The recipes requires reputation with Order of the Cloud Serpent and 200 gold, each. Very noisy mount tbh. Great looking, but too noisy. Ctrl+s is imminent. I swear I can hear it "jingle" as I ride it. This costs about 24k to make in my server, just like the other panthers. Be careful of using all panthers to make a Jeweled one as those have been duplicated recently, lowering their price under material cost..which is just sad (I made my own). The thing that sold me was that it can fly and be a land mount at the same time, and like the gryphon mounts, you can also mount it in water. 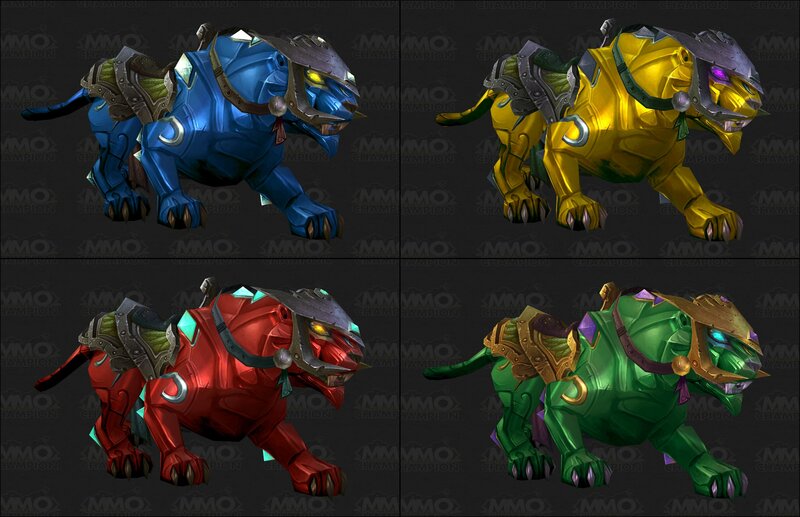 I used to wonder why you couldn't make a Purple or an Orange panther, but then it dawned on me...Did anyone else notice the Voltron reference with these mounts? Anyone who remembers the 5 Lions would remember the lions were colored Red, Blue, Green, Yellow, and Black! This mount does not count towards mount collection achievements. "Legends say that an ancient pandaren emperor crafted the first jeweled panther for his son after the boy's twin brother died of an illness."